About 1000 years ago, a brutal eruption opened a crater above the village that today is known as Fleri. The lava arrived at the sea, and then submerged into the sea along the coast of Pozzillo. The explosions, instead, created a wonderful volcanic cone, one of the biggest of Mount Etna: Mount Ilice. 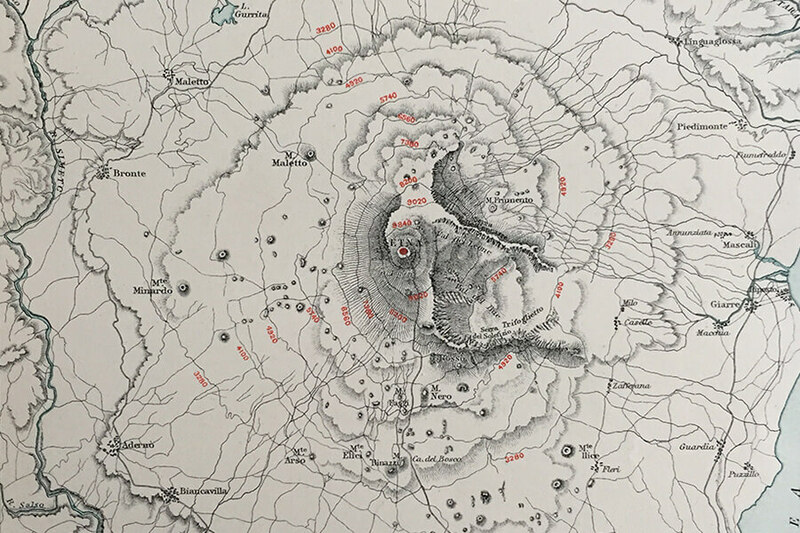 Thanks to the life forces of Mount Etna, the crater soon became an oasis: the name of Mount Ilice comes from the huge specimens of quercus ilex (holm oaks, that in Sicily are called “ilice”), that soon grew all across the border and inside the fertile crater. The old farmers soon understood its agricultural potential and started to cultivate it a few centuries after. The soil, made of black volcanic sand and stone chippings, was perfect to grow Nerello Mascalese, Nerello Cappuccio, Carricante, Catarratto, and other local grapes that would be used to make Etnean wines. The grapes stayed intact until they were perfectly mature, thanks to the inclination of the crater, its exposure and its sandy soil, and the wine was deemed of high quality and “suited to the navigation” – i.e. it could endure a long sea journey. These characteristics played a critical part in the survival of the vineyard on Mount Ilice through the centuries. The merchants from Riposto’s used to buy the higher quality and more resistant wines at the highest prices, since they could be transported to Northern Italy or to other European country, where the wine was “paid more”. These highest prices allowed the owner of the vineyards on Mount Ilice to justify the efforts that were required to grow a vineyard in such a difficult territory. Its strong inclination and the softness of the sandy soil forced the winemakers to make “one step forward and two steps back” while working in the vineyard. This volcanic cone was considered extremely suited to this kind of cultivation, so much that a vineyard was planted inside the crater itself. Since it was very difficult to carry the grapes on such a steep terrain, many small palmenti (millstones) were built in various parts of Mount Ilice and in the surrounding area, so the vinification could be performed on site. The southern slope of the Ilice crater has always been grown through the centuries as a vineyard and partly as an orchard, with a wood area full of holm oaks and Etnean birches. The fate of the vineyard changed substantially when, on the 6th of August, 1944, Carmelo Torrisi, owner of the entire lot as indicated in his will, in the name of His Royal Highness Umberto of Savoy, Prince of Piedmont, bequeathed a property of about six hectares, mostly grown as a vineyard, to his eleven nephews and commanded to divide it into equal parts. The lots were assigned by a draw made by a six years old kid called Umberto, who was illiterate, as certified by a notary, in order to assure that the process was impartial. All the buildings were divided among the nephews, except the old millstone, that was supposed to be shared and that would be used by all of them for decades to perform the vinification. The years went by and the lots were cultivated with varying levels of intensity and passion. The western lots were unfortunately partly abandoned. In 1963 Alfio Puglisi, a young farmer and vines enthusiast, who had worked in many other vineyards on the slopes of Mount Etna, discovered that some of the lots of the vineyard were on sale. Young Alfio was looking for a “small patch of land” that he could buy. He went there, saw the ancient plants and dig up the soil with his pickaxe. He fell in love with the soft volcanic soil: “I never found one single stone. The stones that are here, I brought them”. So, he bought the land. 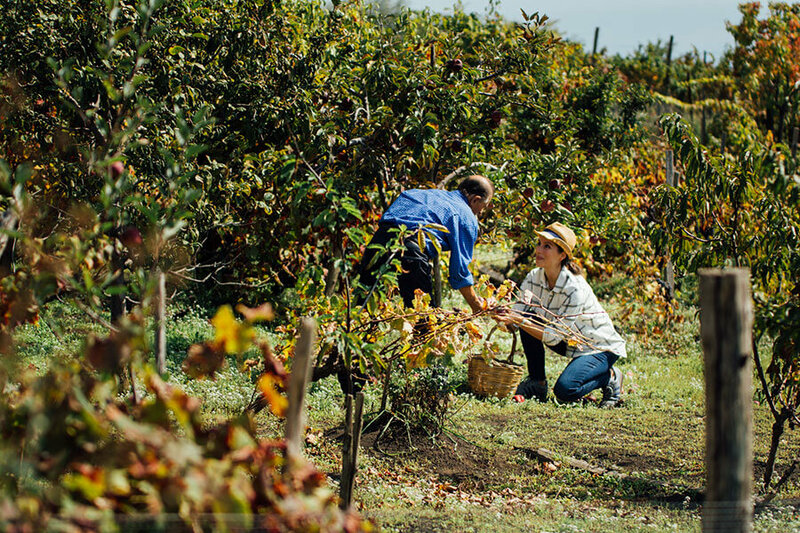 Through the years young Alfio cultivated his vineyard with true love and passion and, every time he found a fruit tree or a vine with extraordinary or “special” fruits on Mount Etna, he reproduced it in his vineyard, his own Eden, a true heritage of Etnean biodiversity. It’s thanks to him that the vineyard and the surrounding plants have survived. Young Alfio, today called Don Alfio, has been growing them for more than half a century without using any chemicals, but following nature, its phases and its signs, both in the vineyards and in the winery. With increasing age, Don Alfio started worrying about the future survival of his vineyard. To whom could he entrust the care of his plants? 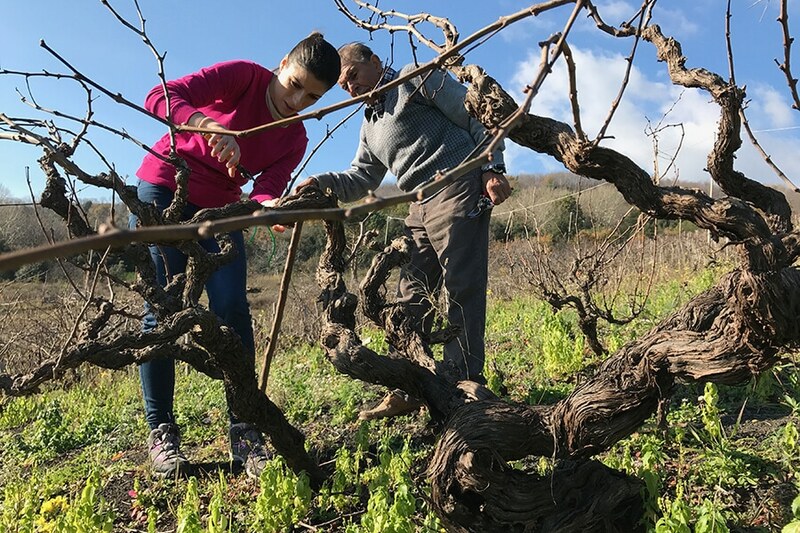 A cold winter morning, Don Alfio talked to me about his problem and brought me to see his vines. He climbed faster than me, with the help of his old stick made of carob wood. Walking on the slope of that crater, on that wonderful and steep soil made of black volcanic soil, through those ancient vines, were almost as entering a sanctuary. A place where you must respect everything that surrounds you, a place where nature goes beyond human will and follows its own rules. Don Alfio was the loyal guardian of that sanctuary. Don Alfio knew that the survival of his vineyard could be assured only by unifying the property as it was before it was divided in 1944, so he tried to arrange a joint sell of all of the owners. An agreement was finally reached with every involved part (about 20 people) and the care of vineyard and soil was entrusted to SantaMariaLaNave. However, we acquired it formally only in 2016, after a complex legal and cadastral procedure aiming to retrace, complete and fix all the transfers of property that occurred through the decades. A typical example of human chaos – while our ancient vines, in our vineyards, located on the slope of the crater, kissed by the sun and by the sea breeze, keep pushing their roots through the volcanic sand and giving us wonderful bunches of Nerello Mascalese, Nerello Cappuccio, Carricante, Catarratto, and many other local vine varieties. All of them, also those abandoned for many years, covered by brambles and damaged by human negligence. We promise them to respect that sanctuary and to dedicate to it all of our efforts, in order to protect it with true love and to bring it back to the ancient magnificence it deserves.